Excellent posting from one of my favourite blogs. ‘People with psychiatric labels suffer discrimination that is not only demeaning but can also be dangerous. A 2007 UK study by the Royal College of Psychiatrists revealed that prejudicial treatment of mentally ill patients extends to physical medical care; they receive poorer quality of care and doctors spend less time with them possibly leading to higher rates of death and preventable disease. Though tragic, the more scandalous aspect of the phenomena is the fact that mental health professionals apply the same prejudices to those whom they attempt to treat. The worst thing someone in mental distress can experience is dehumanizing treatment from other human beings who are supposed to be caring for them. I suppose as long as we continue to label people as ill and abnormal due to mental distress this will continue. We create a class of people who aren’t quite like everyone else. I’ve written about my experience, as a mental health professional and as a person labeled with a serious mental illness quite often on Beyond Meds. I can attest to the fact that depending on how I choose to identify myself with other professionals, I am treated radically different. Generally speaking, when I identify as a social worker, rather than the author of Beyond Meds – which is identified commonly as a “patient” blog – I am received with respect by mainstream and alternative professionals both. I am also engaged more deeply and with more interest. On the other hand, when I identify primarily as the author of the blog but also a mental health professional, I am more likely to be treated dismissively. Because those professionals who profess to share my interest in radically changing the system or using alternatives to psychiatry exhibit this bigotry as well, it only reinforces how deeply entrenched these prejudices are across all sectors of society. Clearly what professionals across the board remember once it’s disclosed is that I was a user of psychiatry: a mentally ill person. I don’t consider myself as such – not anymore, but that doesn’t seem to matter even, quite often, among those professionals who profess not to believe in mental illness! My online experience of identifying as patient vs. social worker, therefore, offers me a unique perspective. The sad fact is that the majority of those in mental distress are subject to the care of mental health professionals who consider them inherently less than equal. This is not generally recognized because on a conscious level people believe they really care. But well-meaning and acting with prejudice are unfortunately not mutually exclusive. I don’t know how one extracts this insidious form of bigotry. People don’t see it in themselves. How do we help them see? One way, of course, is to begin to courageously find and root out our own bigotries. All human beings have them. Peer counseling, too, is a concept that may help bridge the divide between clinician and patient. When we meet those we are helping from a place of vulnerability and equality, we can bring about healing. I’ve noted that once I publicly acknowledged my frailty, my humanity, the healing relationship often became much stronger. Some of the connections and healing relationships I’ve made via my work at Beyond Meds have been astonishingly deeper and more honest than any work I ever did as a social worker when I relegated parts of myself as off limits to my clients. I was taught to separate myself this way as a professional. Authenticity is trained right out of mental health professionals and instead a vague and subtle superiority replaces it. How do I know this? Because I too was tainted and saw it in myself, as a professional, even as I saw it in my colleagues around me. I also experienced it as a patient/client, I was actively made ‘other’ by the people I saw professionally. These parts – that of the knowing superior vs the ignorant inferior – are in all of us too, regardless of training! I suggest those in mental health circles who have taken up the mantle of helper become acutely conscious of this so that they might minimize the harm it can cause in relationship with others. Also, I think that the concept of being a peer can be embraced by professionals. As human beings we are all peers. We are all, every one of us, in this wonderful and mysterious thing called life. And all of us are struggling in various ways to make sense of it. Is there really such a difference between someone trained as a clinician and a client? I think not! If those trained to help were also trained to remember that their role as helper was because they have much more in common with their patients/clients than not, then we will start to see a flattening of hierarchy. This begs the question: Is it possible that identifying with a client might actually be a good thing? This is surely exactly why ”peer counselors” are effective. Clinicians are trained to never, ever identify with the client. Why? What is wrong with recognizing shared humanity, even a weakness or flaw, and bonding in that? In providing a safe container from that understanding? The mere instruction to avoid such intimacy at all costs seems like a violent denial of oneself and clients both. It seems indicative of a deep fear of ones own dark parts. How do we help others find their way out of the dark if we hide from our own darkness? Such identification may not always be appropriate to share, no doubt, it may also not be present with many clients. But when it is present and appropriate to share from such a place, with adequate boundaries in place, it can be an incredibly healing experience for both parties. I believe that all our psyches contain a full spectrum of the content of the human psyche within it… some people experience more or less of this or that, but we’ve all got it in there. Healing ourselves and others both require deep familiarity with all its parts. This is not understood particularly well among most mental health professionals, in my opinion. Changing our system of care for those in mental distress requires deactivating the knee-jerk response of professionals and non-professionals alike towards those in psychic pain. Where we start with this is not always clear. I suppose I’m doing my bit here and all those conscious of these issues do what makes sense in their lives. There are schools of psychology that are very adept at thinking about these issues, but most training dwells on “abnormal psychology” thus the sense of “other” becomes a conditioned process as students learn about what is not normal in the human psyche. There are other ways of understanding unusual behaviors without considering it grossly pathological. For example in cases of trauma and abuse unusual behaviors may be highly adaptive. Then healing involves coming to understand how these behaviors or thinking patterns might have once served someone and how one might let them go now that they do not. Needless to say, I’ve made some sweeping generalizations here and thus must add that there are indeed many wonderful healing people in the world. Ultimately what is at stake here is becoming conscious of the nature of our humanity. I am blessed to know many such people, lay and professional both, who are conscious of these issues. Still, it’s very hard for people lost in mental distress to find resources that include deeply healing professionals and so the people who need healing the most often do not find them. How do we change that? I suppose it starts with us going ever deeper into ourselves and lovingly, with compassion, helping others do the same. 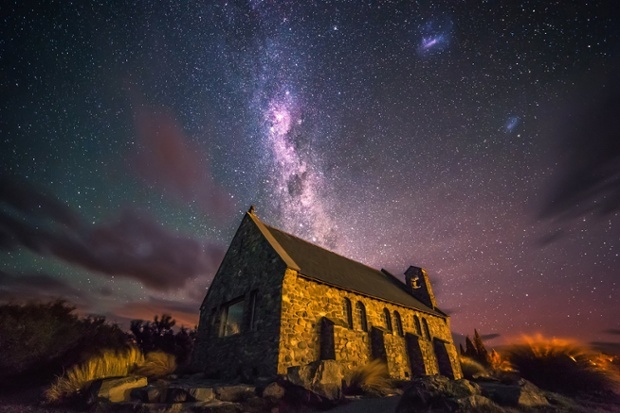 Picture above from The Guardian, National Geographic Traveler photo contest: Tekapo, New Zealand: one of my dreams when I went on holiday to New Zealand was to shoot the night sky. I drove to the famous little church at Tekapo and took some shots before the moon rose. Photograph: Sebastian Warneke.